Some are content to blend in, others not only stand out they appear to parade their differences. 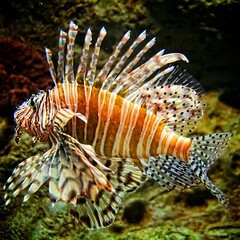 This guy is Pterois miles also know as the lion fish or more dramatically as the devil firefish. They are not native to the American Atlantic coast, but now can be found a along it.